A long-lost Modigliani portrait, a grieving brother’s blood vendetta, a Soviet secret that’s been buried for 80 years—Parisian private investigator Aimée Leduc’s current case is her most exciting one yet. The cobbled streets of Montparnasse might have been boho-chic in the 1920s, when artists, writers, and their muses drank absinthe and danced on cafe tables. But to Parisian private investigator Aimée Leduc, these streets hold darker secrets. When an old Russian man named Yuri hires Aimée to protect a priceless painting that just might be a Modigliani, she learns how deadly art theft can be. Yuri is found tortured to death in his atelier, and the painting is missing. Every time Aimée thinks she's found a new witness, the body count rises. What exactly is so special about this painting that so many people are willing to kill—and die—for it? "Francophiles and mystery-novel lovers alike will devour investigator Aimée Leduc's latest outing, which takes her through the gorgeous if treacherous world of black-market art in Paris, as she safeguards a long-lost Modigliani painting." "Aimée Leduc is never less than chic." "Black is an old pro with a ear for language and dialogue and a gift for knowing just when to pop the next surprise." 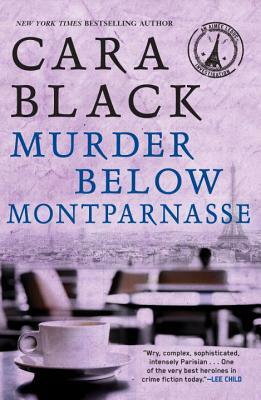 "For those who love or long for Paris, Cara Black's Murder Below Montparnasse is an intriguing wander through the streets of the French capital." "A breathless tale of double-, triple- and quadruple-crosses as the private eye finds herself at the heart of a century-old plot that incorporates not only the great painters of the avant garde but also one Vladimir Illyich Lenin." "Brisk, engaging . . . Another great Aimée Leduc read; fans will be intrigued by the new developments." "Dressed in black leather leggings, ballet flats, a retro-Pucci silk tunic topped by a flounced jacket, sitting on a Recamier sofa, her bichon frise Miles Davis beside her, discussing the latest case with her associates, dwarf-like computer expert René Friant and down-at-the heels aristocrat Saj de Rosnay, she can only be Aimée Leduc, the most famous private detective in Paris." "Black’s writing is wonderfully evocative, making you feel like you’re walking on the streets of Paris with Aimee or ducking into a bistro with her. Even if you haven’t read any of the previous books, you can jump into the series with this novel without much effort, and with the reward of reading a wonderfully crafted and involving mystery." "As usual, Cara Black imparts her love for Paris. Here she vividly sketches the past glamour of Montparnasse." "Murder Below Montparnasse is fast-paced, exciting and interesting." "This series gets better and better with each book, and I can't wait to see what sort of trouble Aimée gets into next!" "Forever young, forever stylish, forever in love with Paris—forever Aimée." "Wry, complex, sophisticated, intensely Parisian.... One of the very best heroines in crime fiction today."